Robin Truesdale is a professional video editor, photographer, and graphic designer with more than twenty years of video production experience. With a background in television news and educational video, she began making documentary films while in graduate school in 2001. Her independent work deals primarily with social justice, culture, and humanitarian issues. She specializes in documentary film editing and has film credits as Editor, Director, Co-Producer, and Photographer. She is based in Louisville, Colorado. Robin is currently editing Sweet Home Monteverde, an hour-long documentary about a group of Quakers from Alabama who, in 1950, left the U.S. to build a new community in Monteverde, Costa Rica. Her most recently completed documentary, Cuba’s Forgotten Jewels: A Haven in Havana (2017), tells the stories of Jewish refugees who fled Nazi-occupied Europe and sailed across the Atlantic Ocean to the island of Cuba. Robin co-directed the film with Judy Kreith, and was the film’s cinematographer and editor. She has spoken about her freelance work and documentary filmmaking at a number of conferences and workshops, including the NPPA Women in Visual Journalism Conference, Rocky Mountain Audio Video Expo, 2017 Rocky Mountain Women’s Film Festival, and the 2018 Fairbanks Summer Arts Festival in Alaska. In 2015, Robin finished A Beautiful Equation, an independent documentary film that explores the humanitarian philosophies of Albert Einstein and Niels Bohr. In an interesting twist, their stories are told by eight women – grandmothers – who add a depth of knowledge and experience, and who themselves become vivid characters who deliver a hopeful message. Robin’s documentary work has taken her to Africa on three occasions, twice to Zimbabwe and once to Kenya, where she shot video for numerous projects including a documentary film and several non-profit video productions. Her personal connection to African artists led her to curate the ZimArt 2009 art show in Boulder, Colorado, showcasing a stunning variety of works relating to the culture and music of Zimbabwe. 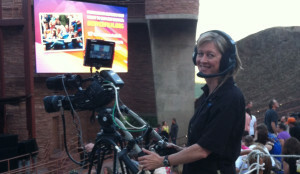 During the summer and fall, Robin spends evenings filming performances at Red Rocks Amphitheater in Colorado. She’s a member of a talented crew that covers world renowned acts for the big screen at this internationally acclaimed venue. In 2013, Robin was the Festival Director for the Natural Transitions Film Festival in Boulder, Colorado. She sat on the Board of Directors for the 2011 Life and Death Matters Film Festival. Each event’s mission was to explore and celebrate the human journey, examining how we meet difficult life challenges surrounding end of life. From 2006 to 2011, Robin worked at InJoy Childbirth and Parenting Education as an award-winning Photographer/Editor. At InJoy, she produced educational programs that guide expectant and new parents through the processes of pregnancy, childbirth, and raising healthy children. Since 1996, Robin has maintained a successful freelance business. Her company, RT Editing and Video Production, provides full-service video production. She has co-produced and edited U.S. Army curriculum materials that coach military members in positive intercultural communication. Other projects and clients include Beyond Consequences Institute, Variety of Colorado, the Colorado Governor’s Office of Energy Management and Conservation, Colorado Energy Science Center, Careers for the 21st Century, The Art of Thai Yoga Massage, Yoga With Richard Freeman, Great Divide Pictures, NBC, ABC, and Olympic Games Coverage. In 2003, Robin received her Master’s Degree from the University of Colorado School of Journalism. During her course of study, she was a graduate assistant and adjunct professor, teaching video photography and editing, and coordinating the student-produced television news program. From 1987 to 1996, Robin was a television news editor at KUSA-TV Denver where she edited daily news, in-depth series, and TV specials. She received her Bachelor’s Degree from the University of Colorado School of Journalism in 1987. Robin is a former member of Pick Up Sticks Marimba, a band that plays high-energy, foot-stomping music from Zimbabwe. She has performed with this Africa and World Music percussion group at festivals, conferences, and private events in Colorado, New Mexico, Oregon, and Washington. Professional memberships include the Kappa Tau Alpha Journalism Honor Society, Denver Film Society, Boulder County Arts Alliance, Colorado Film and Video Association, Boulder Digital Arts, and Boulder Documentary Filmmaker’s Collective. Robin is married with two sons and two lovable Siberian Huskies.